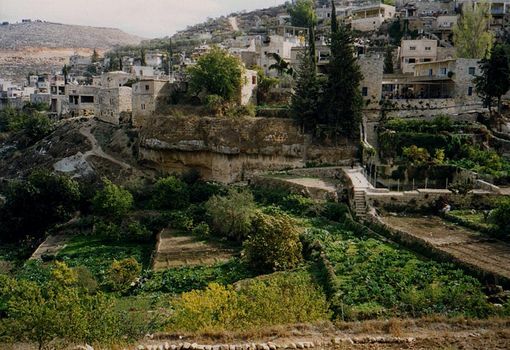 Battir lies perhaps five miles west of Bethlehem as the crow flies, but access is circuitous. 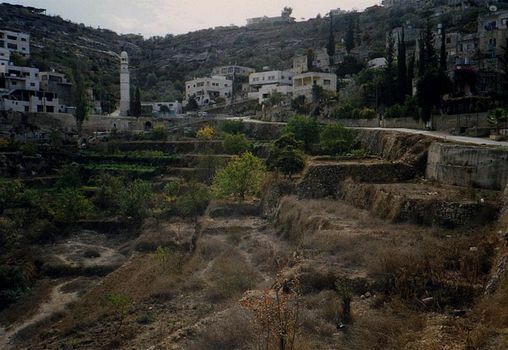 The road runs far above the village and to its south, then drops northward down a long, steep hill and levels out at the village mosque, center of the village. Battir used to be known to all visitors to the Holy Land, but that was back in the days when people took the train to Jerusalem--and because the train stopped at Battir for passengers and water. Battir was then part of a unified Palestine. Its proximity to Israel--the Green Line follows the railroad here--probably has made village life harder, rather than easier. The first of a series panning to the right. Here, the railway heads east toward Jerusalem, visible at the left background (the track follows a creek foul with the city's raw sewage). 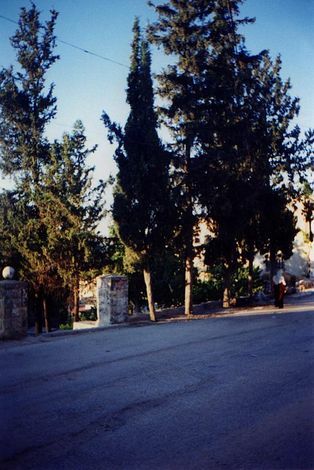 The hill in the center distance is scarred by a bypass road around Bethlehem, which lies on its far side. "I hate it," one Battir resident said of that road. 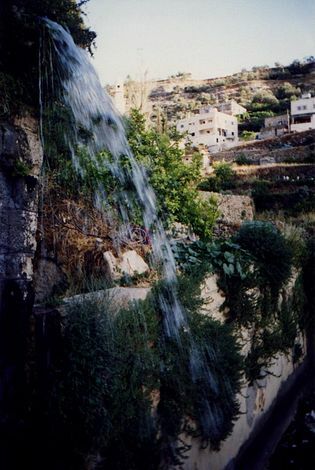 Battir's long history is closely tied to the spring that irrigates the crops shown in the foreground. The spring is just to the right. Swinging to the right: the pond, fed by the open chute that looks like a stone water slide, stores spring water overnight for use the next day. The bypass road, still visible in the background, was built as a temporary road while a more dramatic one with tunnels and bridges was completed. There is very little traffic on it now, but it is still kept open, with border police making sure that West Bank Palestinians don't use it. It's only a couple of miles from the length of the road shown here to the Jerusalem Mall, with a Burger King and multiplex cinema. For the people of Battir, the distance might as well be measured in parsecs. The camera takes in more of the irrigated valley. The water in the pool is measured in the morning and divided each day among the landowners who are traditionally entitled to the water on that day of the week. A few years ago, the channel that brought water from the spring, in the right background, was replaced by a pipe. (Engineers often seem to think that efficiency justifies anything.) Above the pool and obscured by trees is a school operated by the United Nations Relief and Works Agency, still serving Palestinians after all these years. Farther up the hill, there is much new construction of the utilitarian sort built across the West Bank since the Jordanian period. 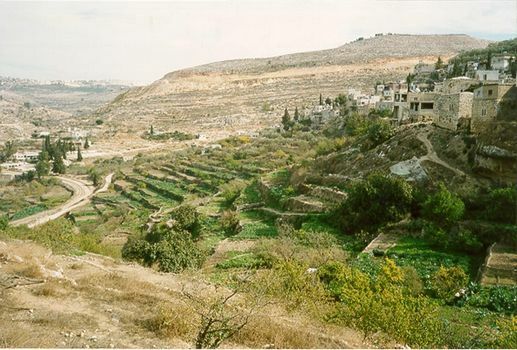 Until 1949, the picture would have shown much more intensive agriculture, in the latter days because the villagers since the opening of the railroad in 1892 had been taking vegetables to Jerusalem on the early-morning train from Jaffa. The Armistice of 1949 left Battir as part of Jordan. Cut off from their market, many villagers abandoned their terrace plots. What had been the most photographed highland village of Palestine became an isolated place, only partly rescued a few years later when the village's long, steep access road was built so villagers could at least get to Bethlehem by something other than foot and donkey. This picture was taken by sticking a camera into the pitch blackness of the Battir spring. 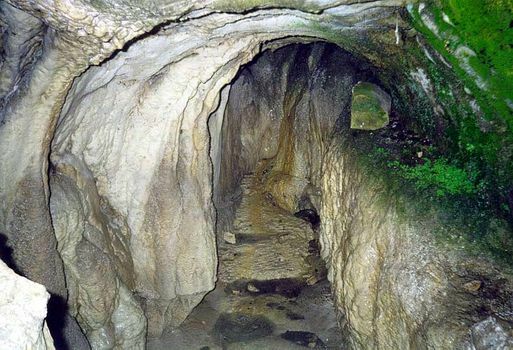 What appeared to the eye as a pitch-black cave appears here as the mouth of a tunnel opened up heaven knows how many centuries ago. Pity that the flow from here to the storage pond was put into a pipe. Water cascades from the chute to the pond. Even though agriculture has declined in the village, the spring and irrigation system are still the village icons. Is there another? A few hundred yards away, behind the spot from which the first few pictures were taken, is a hill known to the villagers as "Khirbet el-Yehud," the ruin of the Jews. It's a hilltop besieged by the Romans in the second century when they finally crushed the last Jewish revolt. 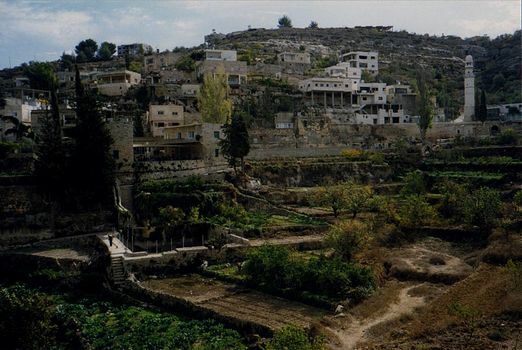 Israelis used to visit Battir to see the tragic site, but that was before the Intifada. Now it's a rare thing to see a car here with yellow--Israeli-- licence plates. When you do see one, chances are it belongs to a Palestinian from East Jerusalem. This is the entrance to the abandoned house of Hasan Mustafa, the leading figure of Battir during the critical decade of the 1950s, when the village had just been severed from Jerusalem. He is remembered as a giant of his time, a man disinterested in his own advancement but deeply caring for the people of his village. He was well placed to do so, because he worked with the United Nations. Through his efforts, the road to Bethlehem was built, a telephone was installed, and schools and clinics were built. When this picture was taken, one of Hasan Mustafa's grandsons was held in a British prison, where he was serving a 20-year term for involvement in bombing Israel's embassy in London. It was a controversial case, still in the international press from time to time. Meanwhile, the house was empty, Hasan Mustafa was dead, and the son who inherited the house had become a journalist in Europe.